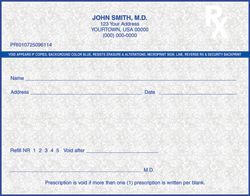 Standard Florida Tamper Resistant Prescription pad, 1-part, 100 per pad, Size: 5 1/2" x 4 1/4". Imprinted w/blue ink. 2nd part not printed. Includes all security features required by Florida for non-electronically transmitted Medicaid prescriptions. License Number Verification Required. PRICE IS PER PAD, MINIMUM ORDER IS 10 PADS. Imprinted with blue ink. List up to 4 doctors, 6 line maximum. Please type imprint information. Be sure to include; Name, Practice Name, License # for each doctor as well as one office address.